Modern Māori Quartet (MMQ) are an award-winning, good looking, suave contemporary Māori showband in the vein of forebears such as the Hi-Marks, Māori Volcanics Showband, Māori Hi Five, Quin Tikis and The Howard Morrison Quartet. 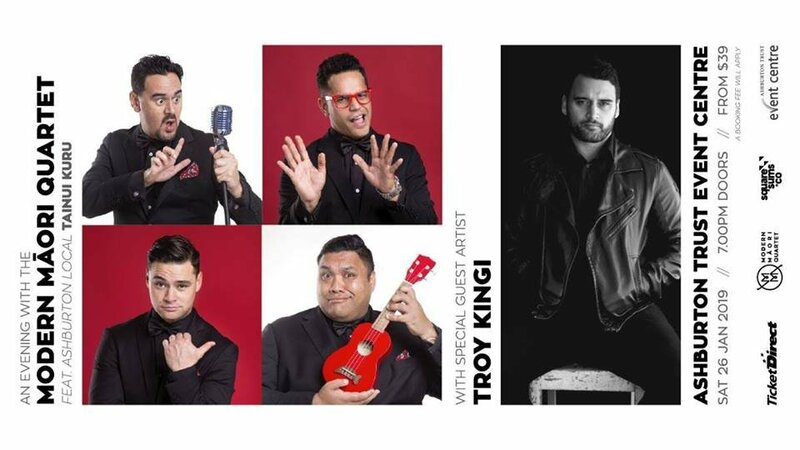 MMQ invites you to a party like no other: a mix of off-beat comedy, stage routines, distinctively Māori waiata (song), dance and traditions, heaps of aroha (love), uniquely Kiwi stories told with epic harmonies and signature tongue-in-cheek Māori humour, charm and charisma. MMQ is excited to be featuring Ashburton local success story Tainui Kuru in the lineup for their first concert in Ashburton. Sharing the bill is the funkadelic Kerikeri-based Māori soul superstar and actor Troy Kingi. Beyond his brilliant roles in films including Mt Zion and Hunt for the Wilderpeople (as Selfie Dad), Troy is a multi-award winning Māori musician (Best Māori Artist, Best Soul/R&B Artist, Best Māori Pop Album) with plans to release ten albums across ten genres in ten years, one of the most exciting Māori artists today. So join us for a classy celebration of Māoridom by some of Aotearoa's best Māori entertainers today – hearty Māori entertainment that will warm your heart and make you cry with laughter!